Is that a key in your pocket or are you happy to see me? 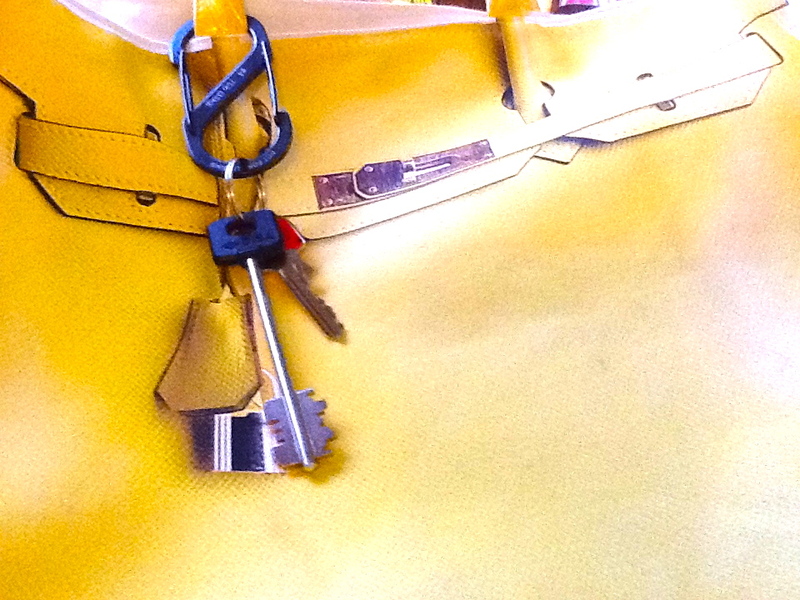 By the looks of the picture, I may need a separate bag just for my keys! The main door key is abnormally long. It kinda makes me feel like I live in a castle, so can’t really complain. These keys mean that we finally moved into our new place by Lo Stadio (The Stadium). It is about 10 min north of downtown. It’s an awesome area, close to the stadium where the professional soccer team Fiorentina plays. There are many bus routes, a park, tennis courts, a huge public pool, friendly stores and many grocery stores to choose from…and lucky for me an organic market every Saturday. So, you can say I’m a happy camper, plus Nicco’s office is a 2 minute bike ride away. We had to move out of our old place 3 weeks after we got married, which didn’t leave much spare time to look around. I was a realtor in Miami for 5 years, but soon learned that realtors work completely different here. They show you their own listings, so you actually need to work with multiple realtors. This is why we had to scour through www.casa.it, which is the main site for houses and apartments. Searching for places online was a major fail on my part, since I had no clue which area to look for. The names of the little neighborhoods in Florence didn’t ring a bell, so it was really difficult and frustrating to try and help Nicco look for a place. We ended up seeing 10 places, all great, but each with a major con. As fate would have it, his mom called us two days before we had to move out and said she had a friend looking to rent a two bedroom. We saw it the next day and moved our things in the following day – same day we moved out of our old place. Major score! Thanks to La Mamma, we have an awesome huge pad for us newlyweds to settle down in for a few years. It certainly pays to know people in town to get what you are looking for, or an Italian Mother-In-Law. Now that we’re back from Viareggio, our weekends will be filled with hardware stores and Ikea! I see some painting in my future. Thanks to Pinterest I have a few DIY projects that I want to do. Check them out and share which DIY you would do or just share your apartment hunting stories under comments. Italian textured paint, yea or nay? Thats a really interesting house key. I am not sure that I have ever seen a key like that. 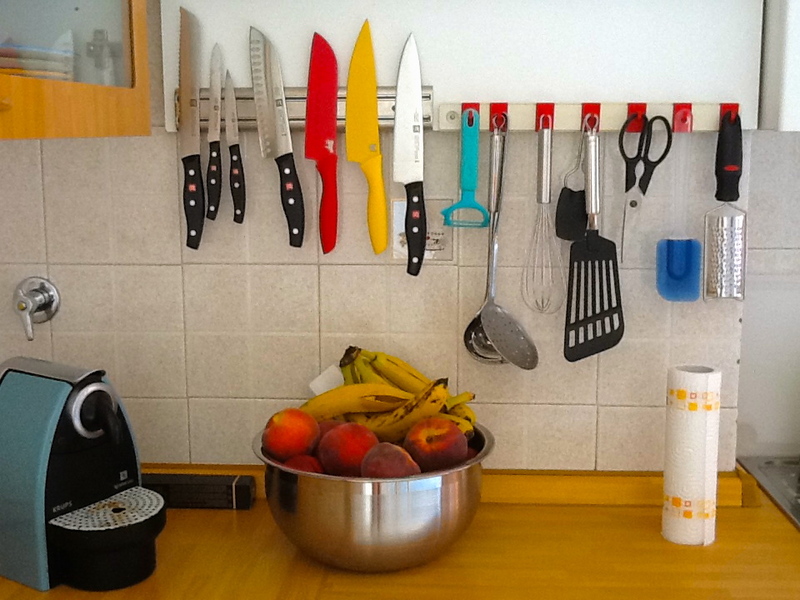 Love your Henkel knives….the kitchen looks cute. I love Pinterest too. I m redoing our house in The Keys and I use it for all my ideas and colors. Yes, the key is crazy long. I need to get used to carrying it around! Thanks, we looove our knives, they cut everything like butter. Have fun redoing your place in the Keys! Pinterest is so great for new and easy DIY ideas! Send pix when done. I am sure I could use more inspiration to finish my new place.